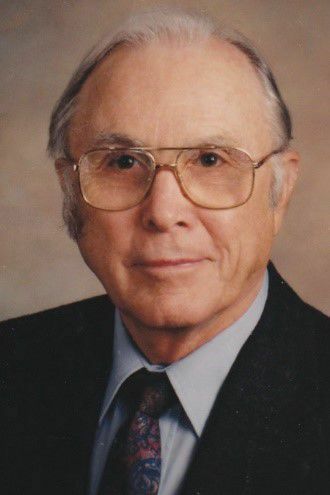 Calvin Leonard Cox was born at home in Huron, S.D., on April 19, 1925, to Ronald V. Cox and Mayme (Rodine) Cox and died at home in Kalama on March 2, 2019. Cal moved to Lebanon, Ore., the day after graduation, working at Evans Plywood and High Groves Hardware. Cal was a World War II veteran, assigned to Company A 1299th Engineer Combat Battalion in the Pacific Theater when Japan surrendered, becoming part of the first occupation forces in Japan stationed in Morioka, Iwate, Japan. After his discharge Cal attended Oregon State College (University) where he met Mary Moynihan. They were married on March 31, 1951, and would have celebrated 68 years together this month. He worked in lumber mills in Portland, Springfield, and Roseburg, Oregon, moving to Kalama in 1961 where Cal worked in sales at Pope & Talbot Plywood. After the mill closed, Cal became a licensed real estate agent and notary and opened Arrow Real Estate. Cal maintained his broker’s license until his death. In retirement, Cal and Mary traveled extensively, visiting Europe, the British Isles, Egypt, Australia, New Zealand, Russia, China, Japan, Canada, and most of the United States. Cal was active in community government, serving three terms as Port Commissioner for the Port of Kalama, instrumental in the revitalization of the City of Kalama waterfront. He was past president of the Kalama Chamber of Commerce, Fire Commissioner for Kalama Fire District #5, on the Cowlitz County Planning Board, Board of Equalization, Substance Abuse Advisory Board, and the Veterans Advisory Board. Cal belonged to the Elks Lodge, VFW, and was a 60-year member the Masonic Lodge of Kalama and Roseburg, Oregon. A member of Kalama Lion’s Club, he served actively until just before his death. Calvin was preceded in death by his parents, and his brother, Ronald Cox, Jr. He is survived by his wife, Mary; children, Colleen Andreotti (Patrick), Calvin Cox, Randall Cox, and Martin Cox (Kathleen Garber); grandchildren, Michael Andreotti (Lindsay), Virginia Andreotti-Jones (Luke), Mary Pursley (Patrick), Tia Conaway, Kristina Cox, and Caiden Cox; five great-grandchildren; and numerous nieces and nephews. An open house to celebrate Calvin’s life is planned from 1 to 4 p.m. Saturday, March 16th, 2019, in the Lucky Dragon Banquet Room in Kalama. Family and close friends are invited to come and share their memories of Cal. Private burial with military honors will take place at Willamette National Cemetery. In lieu of flowers, the family requests memorial contributions may be made to Peace Health HomeCare and Hospice, P.O. Box 1600, Vancouver, WA. 98668, or a charity of choice.